Czechoslovakia historic radioclub. Organisation of Czech and Slovak radio collectors. 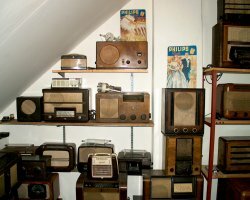 Welcome to the first Czech web page about former Czechoslovakia radio receivers from the 20's to the 70's. You can see receivers from 20's to the 40's, Tesla radios from 40's to the 70's, including the well known Tesla Talisman 308U, Tesla TVs, radiograms, portable radios, etc. with links to User manual, Schematic diagram, Service manual, Technical information for TV receivers and tape recorders in PDF format.